The Universe, according to science, began with the Big Bang about 14 billion years ago. The Universe, at that point in time, was believed to be so small it would have fit into a pinhead a million times overs, and was so hot and dense that our Minds can not fathom. Then…… it exploded. It exploded and in fractions of a millisecond, the Universe grew ….. and has kept on growing! Within a few minutes, temperatures continued to fall rapidly (albeit still hot beyond today’s earthly comprehension, probably around 1b degrees Celsius) and it was now cold enough for neutrons and protons to fuse together. 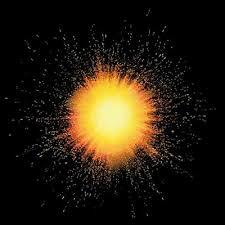 After a further few hundred thousand years the Universe had cooled further, probably between 2000-5000 degrees, and the atomic nuclei formed from the fusion of neutrons and protons began to capture electrons which formed atoms. The atom is the ‘basic’ unit of matter and it consists of a nucleus surrounded by negatively charged electrons. And everything in the universe is made up of atoms vibrating at different speeds, so fast that they appear solid to our human senses, but in truth continuously moving and vibrating. Everything is made up of atoms, the chair you are sitting on, the mobile device or laptop you are reading this on, and you — your human body. And this is why we are all One. This is why we say we all come from the same Source. ← Why time of the day matters! Exercise Life Hacks!! !